Tag Archive | "JV Girls Basketball"
The Cedar Springs JV girls basketball team finished strong last week, winning their last 2 games and clinching the OK-Blue conference title. They defeated the Belding Redskins on Tuesday, and the West Catholic Falcons on Thursday. These two wins brought their overall record for the 2011-12 season to an astonishing 18 wins and only 2 losses. Winning the OK Blue Conference with a record of 14-0 gives them a lot to look forward to in the years to come as they move on to the varsity level. 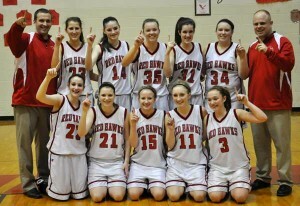 The Cedar Springs JV Lady Red Hawks completed there 2010 -2011 basketball season last week. The JV Lady Red Hawks finished the season with an 8-12 overall record. Each one of these young ladies took advantage of each opportunity they were given to work and play hard. They worked well as a team and each girl has gained more confidence as well as teamwork and friendship. The JV Lady Red Hawks would like to thank their coaching staff for all the time and effort they have given the team as well as the Cedar Springs athletic program and sponsors, their parents and fans and the local newspaper the Cedar Post for all the support they have given them through out the 2010 -2011 season. Allie Veltkamp was high scorer. The JV Red Hawks basketball team hosted Tri County on Tuesday, February 8. Tri County came out in the first quarter scoring the first 2 points of the game. But after that the Red Hawks took control and scored 8 points before the Vikings could make another basket. Cedar held the lead at the end of the quarter 12-6. In the second quarter, the Red Hawks scored another 10 points and went to the halftime break leading 22-17. The Vikings came back from the break and scored 16 points to the Red Hawks’ 10 points and took the lead 33-32 at the end of the third. But Cedar came back strong in the last quarter scoring 13 points to Tri County’s 7 points. The JV Cedar took the victory 45-40. Allie Veltkamp was high scorer, while Tamar Clark, Jeanette Sukstas, Abby VanDusen, Shaelyn Fasel and Sommer VanDyke also scored for the Red Hawks. On Thursday February 10, the JV lady Red Hawks hosted Coopersville. The Red Hawks came ready to play scoring 13 points before the Broncos got on the scoreboard. Cedar led the game 13-4 at the end of the first. A slow second quarter for both teams only saw 12 total points scored, with the Red Hawks still leading 17-12 at the halftime buzzer. Both teams came back in the third with stronger play and better scoring, with the Red Hawks scoring 11 points to the Broncos 9 points. Cedar held the lead 28 -21. Their tough defense held Coopersville to only 2 points in the fourth quarter, while Cedar Springs pushed hard and scored a total of 15 points. The JV Red Hawks girls took the victory with a final score of 43-23. Balanced scoring saw Shaelyn Fasel, Abby VanDusen, Jeanette Sukstas, Sommer VanDyke, Allie Veltkamp and Tamar Clark all contributing to the total points for the Red Hawks. The JV Lady Red Hawks were scheduled to travel to West Ottawa on Tuesday February 15, and to Forest Hills Northern on Thursday February 17. Read about those games in next week’s Post! JV Red Hawk Shaelyn Fasel driving for the basket. The Cedar Springs JV Red Hawk girls basketball team hosted Forest Hills Northern on Thursday, January 13. Cedar Springs started out slow and fell behind early in the first quarter 10-4. Early foul trouble and turnovers really hurt the Red Hawks. They went to the locker room at half time behind 24-14. The Red Hawks came back in the third quarter scoring 14 points to pull within 6 points and end the quarter 34-28. They worked hard in the fourth quarter but continued foul trouble hurt the comeback effort and the Red hawks fell to the Huskies 43-35. Allie Veltkamp led the scoring for the Red Hawks. Also contributing to the scoring were Jeanette Sukstas, Sommer VanDyke and Abby VanDusen. The JV Red Hawks game against Kent City on January 18 was canceled due to a snow day, but they will host Wayland on January 20..
Cedar Springs Red Hawk JV Girls Basketball team picked up their first win against Forest Hills Eastern last week. The Red Hawk girls came out strong, took the lead early and led Forest Hills at halftime 23-12. The girls came back with a slow third quarter but held the lead through out the game and defeated Forest Hills 37-23. Allie Veltkamp and Tamar Clark lead the Red Hawks in scoring, while Jeanette Sukstas, Sommer VanDyke and Abby VanDusen also contributed points for the Red Hawks. Shaelyn Fasel, Mercedes Gonzales, Molly Caniff and Amber Freiberg came off the bench with good playing time to assist the JV Red Hawks with the victory. “It was a hard fought game and a real team effort,” commented Coach Tom Welsh. The Red Hawk JV girls take on West Catholic on December 14 and Sparta on December 16. Both games are home.